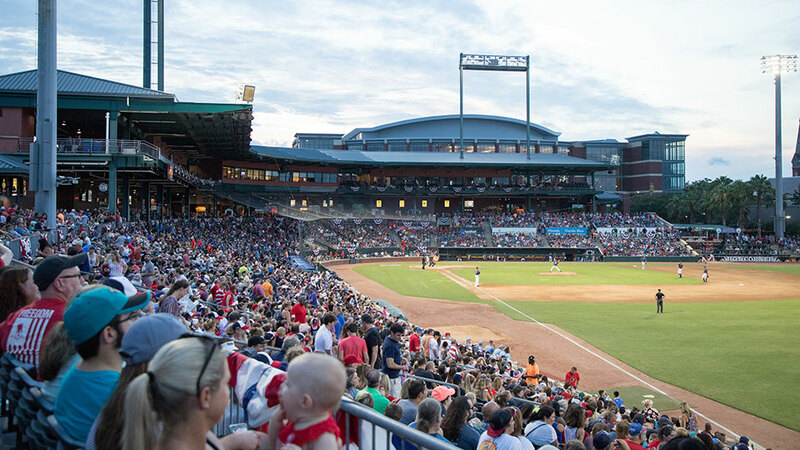 JACKSONVILLE, Fla. - The fans of Northeast Florida continue to respond to affordable family fun with the Jacksonville Jumbo Shrimp, as a total attendance of 317,335 came to home games in 2018. The first two seasons of the Jacksonville Jumbo Shrimp presented by Community First Credit Union mark the first time in eight years that more than 317,000 have come in consecutive seasons to the Baseball Grounds of Jacksonville. The Jumbo Shrimp's average attendance of 5,037 in 63 openings in 2018 also marked the first time since 2010 that Jacksonville has averaged at least 5,000 fans in consecutive years. More than 900,000 fans have attended games at the Baseball Grounds of Jacksonville in the first three years of Fast Forward Sports Group ownership. "With the enthusiasm that has come to signify Crustacean Nation, our fans, partners and the Jacksonville community showed again this season that they appreciate affordable family fun at the Baseball Grounds of Jacksonville," said Jumbo Shrimp Owner Ken Babby. "We thank all of them for another memorable season for the Jacksonville Jumbo Shrimp." 5,037: Per-game average attendance, reaching 5,000-plus fans per game in consecutive years for the first time since 2010. "Jumbo Shrimp fans make the Baseball Grounds of Jacksonville an amazing place throughout the season," said Jumbo Shrimp General Manager Harold Craw. "We are so grateful for the support of our community. It drives our organization to continue providing an exceptional guest experience and prepare for more affordable family fun at the ballpark." UP NEXT: The Jumbo Shrimp host their next Family Movie Night in cooperation with Fun 4 First Coast Kids on Saturday, Sept. 22, at the Baseball Grounds of Jacksonville. The screening of "Trolls" will be on the video board at 7 p.m. Gates open at 6 p.m., and the concession stands, Kids Zone inflatables and Jumbo Shrimp souvenir store will be open. Admission is just $1 per person at the gate, but the Jumbo Shrimp encourage attendees to RSVP at umbel.co/m877F. Opening Day for the Jumbo Shrimp in 2019 is Thursday, April 4, against the Jackson Generals at the Baseball Grounds Jacksonville.